This is one of the three oldest windows in the collection. The image replicates a painting done in 1640 by Guercino (Giovanni Francesco Barbieri, 1591 - 1666) that now hangs in the Civic Museum in the town of Fano, Italy. During the Brownings' visit to the seaside town in 1848, they viewed the painting several times in the little Church of San Agostino. 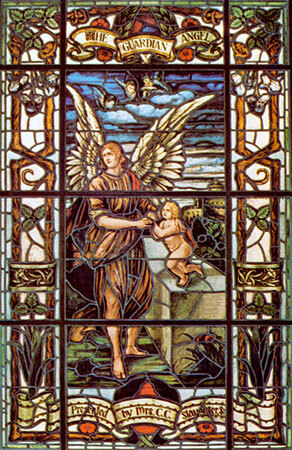 Browning was compelled to write an account of the occurrence in his popular poem, "The Guardian Angel: A Picture at Fano." Excerpts from Robert Browning's "The Guardian Angel: A Picture at Fano"
done with him, for me! O world, as God has made it! --My angel with me too. . . . Presented by Mrs. C. C. Slaughter, Sr.